My last few posts have all mentioned my newfound love for English Paper Piecing. EPP is a fun way to use up oddly shaped fabric scraps while taking a break from sitting at my sewing machine. The downside is that it's so time-consuming! I'm a naturally impatient person, and I will look for any shortcuts I can find. I know some people enjoy the slow, steady pace of EPP, but the "meditative" appeal is totally lost on me. When I learned about glue basting in lieu of thread basting my EPP pieces, I jumped on the bandwagon without a thought. 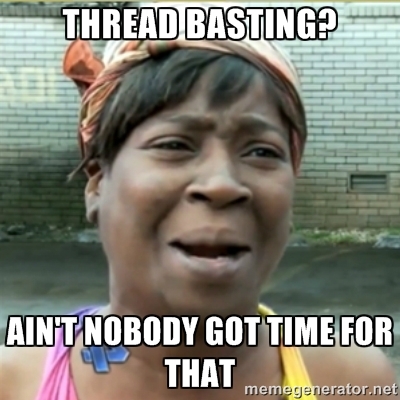 Thread basting just takes too long for my goldfish brain. 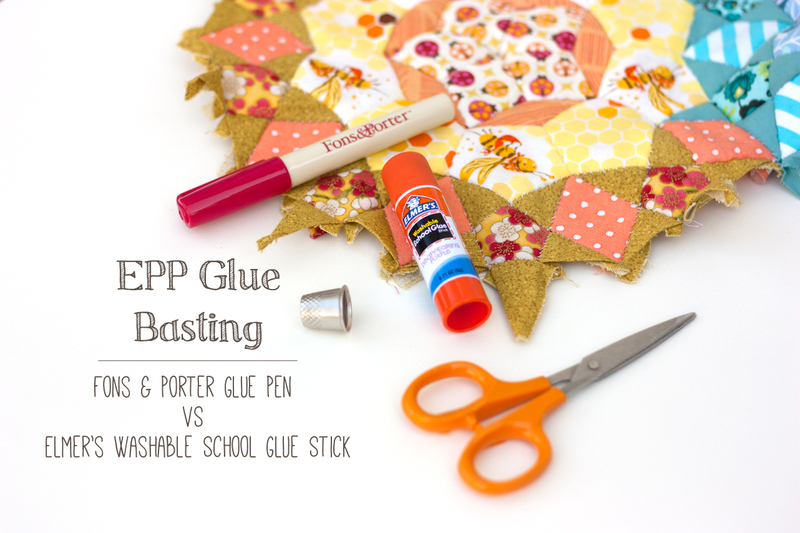 The tutorial I read (linked above) uses a Sewline fabric glue pen, but I also saw posts advocating the classic Elmer's disappearing purple washable school glue sticks. Over the years, I've bought pricey specialized craft tools and materials as well as their cheaper alternatives. Sometimes the cheap products work just as good (like my Niagara starch spray vs the more expensive Best Press), but sometimes you get what you pay for (like my recent switch from Coats & Clark thread to Aurifil). I figured this would be the perfect opportunity to do a glue stick showdown! 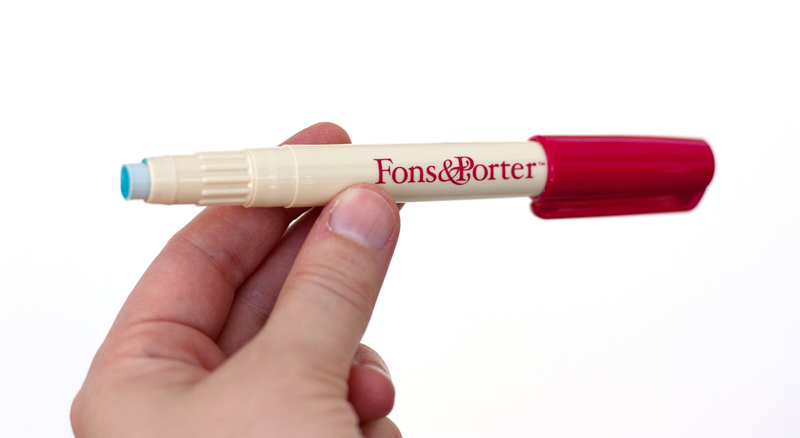 Although most posts I saw used the Sewline glue pen, I purchased the virtually identical Fons & Porter glue pen for $1 less (and free Prime shipping) on Amazon. I'm 90% certain this is a case of a single manufacturer supplying both brands. The pen structure looks the same with the exception of the color and branding of the pen shaft. According to this post, the F&P glue pen refills even fit the Sewline pen. The F&P pen cost me $7 with one glue cartridge. Refills are sold as a 2 pack for about $5. I picked up a 3 pack of the Elmer's sticks for $2 at my local grocery store. They're generally priced at $1 per stick or less. I tested both sticks while basting my diamond jewel star quilt. The F&P pen and the Elmer's stick have a few common features. Both are water-soluble, so they'll wash off your fabric (as well as hands and work surfaces) easily. Both are pigmented upon application (Elmer's is purple and F&P is blue), but dry clear within a minute or so. Right of the bat, you'll notice that the F&P pen has a smaller diameter than the Elmer's stick. This allowed for neater glue application when basting down my side seams. With the Elmer's stick you have a few options: 1) Over-apply the glue which can get a little messy. 2) Use the edge of your stick, which will destroy the clean flat glue stick surface. 3) Apply the glue with half the stick on the paper and half on the fabric seam allowance which effectively "doubles up" your glue when you fold the seam over. On the flipside, I like the fatness of the stick to initially to adhere the paper piece to the back of my fabric. TL;DR: Elmer's fat purple face makes it a bit trickier to apply glue neatly. If I had to pick a pen based on neatness of application, I would go for the F&P, but only by a hair. The texture of the glue differs between the two pens as well. The Elmer's stick has a lot more moisture to it, which gives it more "glide" during application. The F&P pen feels more tacky in comparison. The result is that it takes a few swipes to get enough glue on my paper, but the fabric sticks to the paper slightly better. The Elmer's stick is sufficiently sticky, but may require a firmer finger press. TL;DR: F&P pen takes longer to apply, but is slightly stickier. Due to extra time it takes to apply glue with the F&P, I would give the point to the Elmer's stick here. In the end, the real deciding factor for me was the price value, and to a lesser extent, product availability. My F&P pen cartridge ran dry less than halfway through my diamond jewel star, which is not exactly a big project. I was pretty shocked by how quickly it was used up. While the pen is approximately 4.5 inches tall, the cartridge is only like 2 inches tall! It felt kind of like buying a big bag of potato chips and realizing that the bag is like 50% air with 10 chips in there. It was hard not to feel like I'd been cheated out of my money. 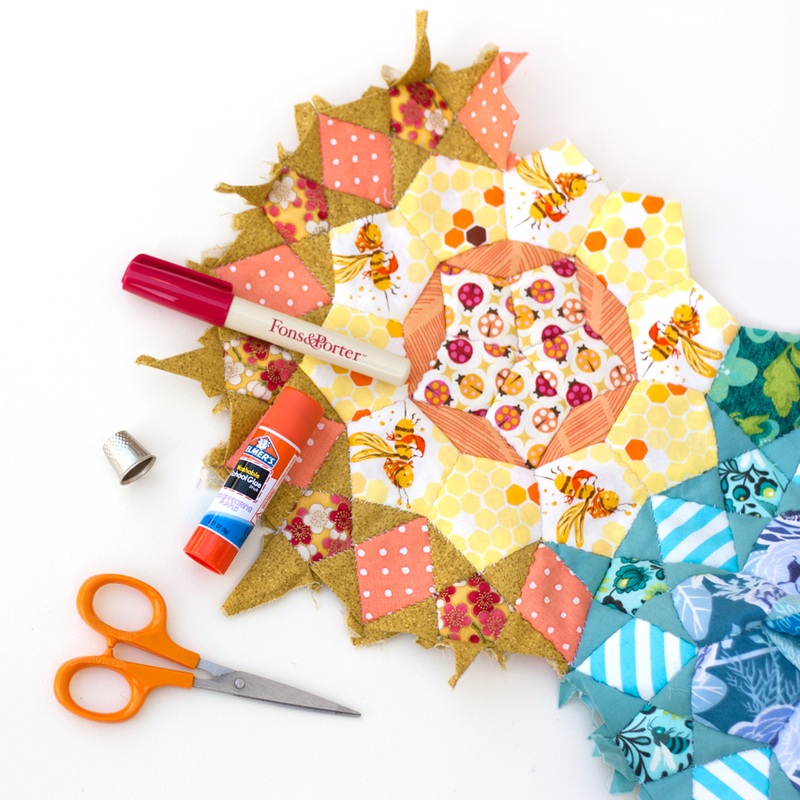 The three Elmer's sticks I purchased for $2 lasted me the rest of the diamond jewel star, my Honeycomb mini and about 4 cogs of my current project, the Passacaglia quilt before I had to buy more glue sticks. Buying 3 more Elmer's sticks would be cheaper (and last longer) than buying the F&P pen refills. Additionally, I would have to make a special trip to Jo-Ann's or order the refills online. When I ran out of my Elmer's sticks, I just picked more up at the grocery store. Convenient! The Verdict: The cheap Elmer's stick wins my seal of approval! I use the Elmer's too! My dollar store carries 3 sticks in a package for a dollar. No brainer for me! That's awesome! I'll have to check the dollar stores near me and stock up a big supply. 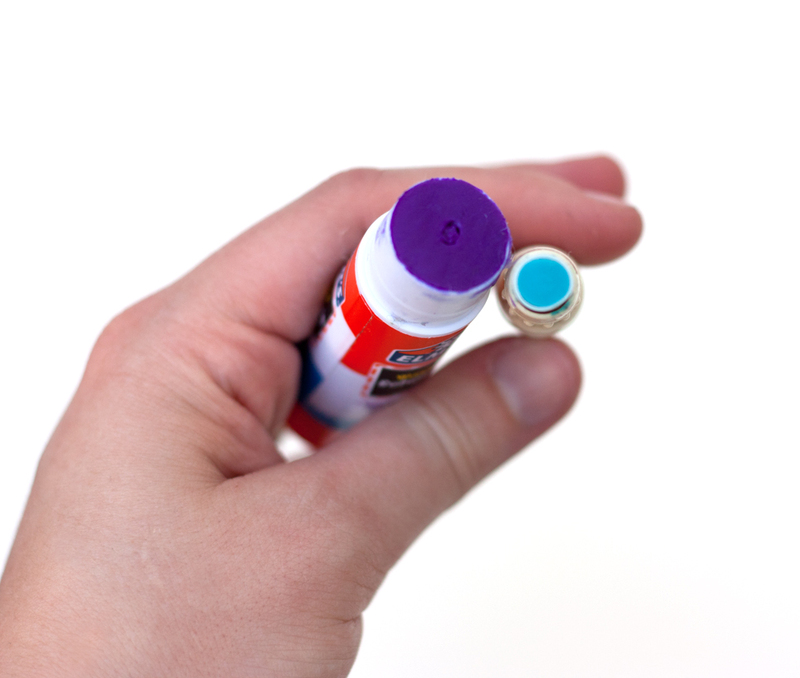 Have you seen that elmer's makes a PRECISION GLUE PEN?! I almost fell off my chair and couldn't click fast enough. I bought 12 for $10! http://www.amazon.com/Elmers-Washable-School-Precision-Teacher/dp/B00JFU5JG6/ref=pd_cart_vw_2_2_p?ie=UTF8&refRID=05EWCBH1D4ACH61YJ0V3 I haven't received them yet but I'm hoping they're just standard glue sticks, in which case TOTAL SCORE. Just in case anyone else is interested in these, they are full of liquid white glue, they are not glue sticks. I just came across this as I was trying to decide if a) I should try glue basting and b) if I needed a special glue pen for it. Thank you for the comparison & breakdown! Is there a trick to getting the elmers glue to release from the papers when they are all stiched up? I'm shredding my papers and was hoping to reuse them. They are Sue Daley's papers so they are meant to be able to be reused. Thanks! This is y first go at EPP! Mine always release without issue and I just use cheap printer paper. Are you using a different variety of elmer's stick? They have permanent kinds that would probably be more stubborn. Thanks for this! I was just looking around for which glue pens I should try. I just got an epic book of EPP designs.